In which sat Jesus Christ, the true wisdom." Jan van Eyck's Lucca Madonna shows the Virgin Mary sitting on her throne nursing Jesus. Mary here is probably acting as a throne for the Christ child. The large chair in the painting doesn't seem to fit with the room and could represent a church. Having the baby Jesus on the lap of Mary was a common symbol at the time and pushes the idea that Mary is the church. The holy pair engage in the act of mortal necessity of their human relationship. The painting has an emphasis on spirit as food, food as spirit. The white and red cloth and the niche on the right of the painting which probably resembles a piscine where priests wash their hands, also contributes to the idea that this scene is that of a church. Clothes: Typical for northern Renaissance, Mary is covered from head to toe in lavish clothing that does not coincide with the traditional Mary in the Bible, who gave birth to Jesus in a manger. Mary's clothes also spread out towards the bottom, invoking the image of a triangle and a structural base for Jesus. Four lion statues: A reference to the story of Solomon. Fertility: Representing motherhood and childbirth, paintings from this time often had to be optimistic because of childbirth complications. The two eggs on the windowsill are surely a sign of fertility and the bowls and vases represent abundance and health. Chair: There are two depictions on the top of the chair. On the right we see an image of a lion/dragon. On the other side is a depiction of a lamb which is an obvious symbol of Jesus. Fruit: Christ holds a piece of fruit, probably representing the Fruit of Paradise - the apple eaten by Eve. 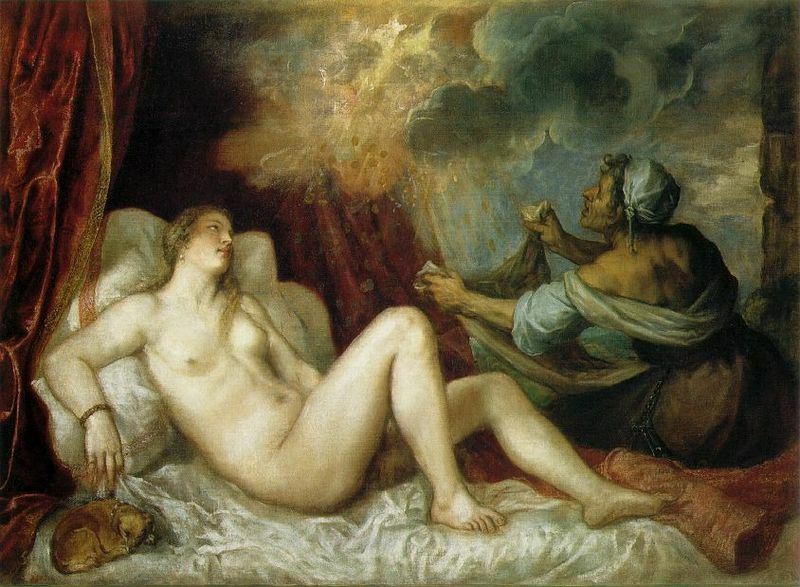 Patrons of the time almost always had a wish to show something of themselves in the paintings they commissioned and it's fair to say that the patron had influence over the painting. It is argued that the commissioner of Lucca Madonna might have been a woman as the painting is clearly supporting or honoring females. 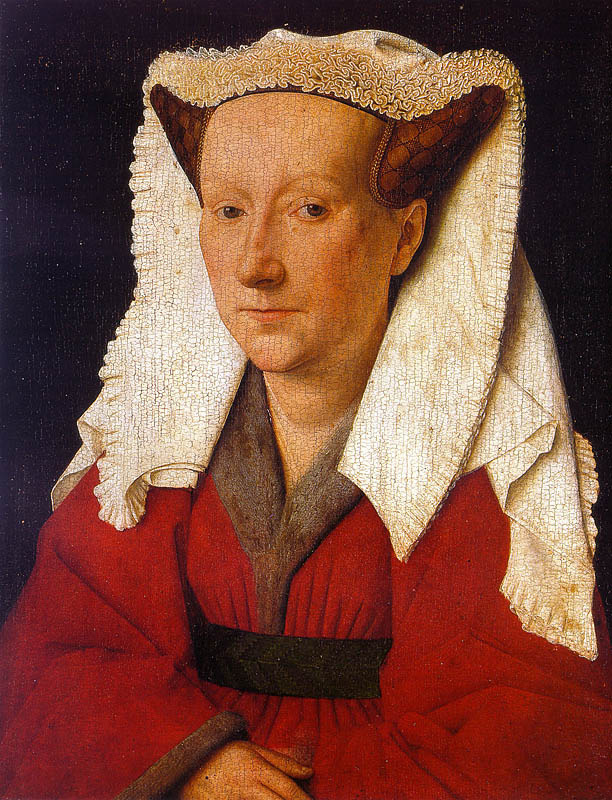 It is generally thought that the Virgin was modeled by van Eyck's wife, Margaret, whom he had created a portrait of but this was probably not meant to be honorific. Although not one of van Eyck's most stylistic or iconographic paintings, the Lucca Madonna is direct and addresses modern devotion. One of his last works, it bears a certain resemblance to Ince Hall Madonna (see Related Paintings below). Van Eyck clearly diverts from the international style in his use of colors; not only from his richness of color but also the fact that previous painters typically used just one color for skin tones. In the Lucca Madonna we see complex tones and up to nine different colors. This painting shows modern devotion, breaking away from the idea of God the 'punisher' which was often the theme in previous Gothic art. 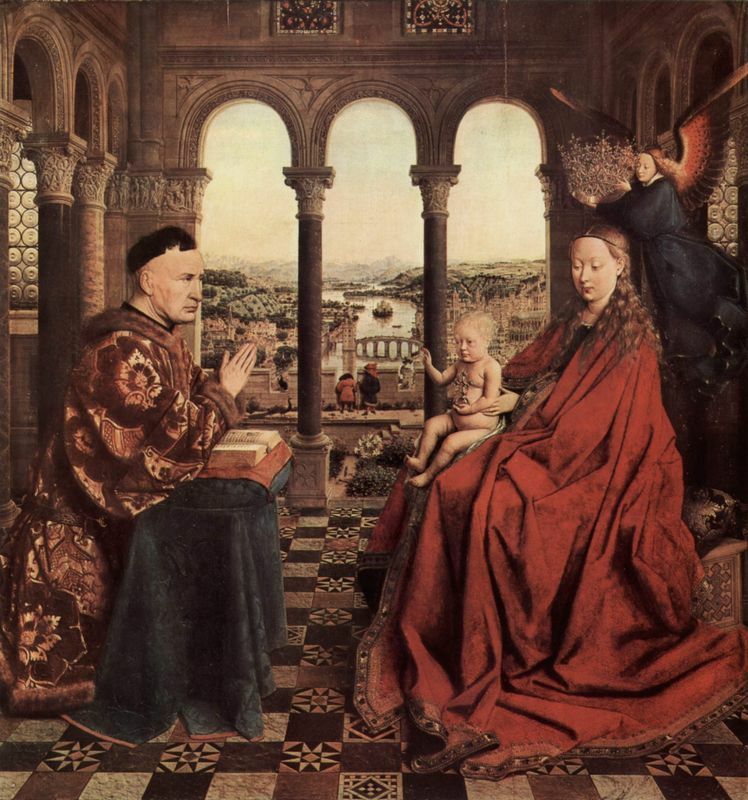 Van Eyck used two distinct brushstrokes in this painting. As was the case with his other large works, he used large brushstrokes especially in the background while keeping the foreground tight with no visible brush strokes. 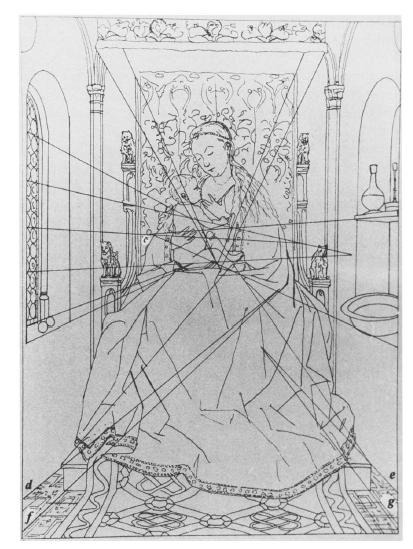 The arrangement of the throne, 'altar, and rug, as well as the light source from the window on the left, draw the viewer to the center of the photo where the Madonna sits. This painting does not hold the iconographic references of the artist's other works but the simplicity and intentional and direct use of perspective in this piece is stronger than in van Eyck's other paintings. Van Eyck was not known for correctly depicting his characters spatially. Here we see Christ painted as a child with a head that seems too large and looks awkward in the arms of the Madonna but this discrepancy isn't new to critics of the artist. Unlike his contemporaries in Italy, particularly Florence, van Eyck did not pay attention or try to spatially depict his characters to the utmost but rather used detail to achieve perspective. Much of his technique is not currently discussed; instead critics focus on the iconography of his works. The Lucca Madonna in technical aspects is of little focus to art critics today but holds relevance in terms of its insight into van Eyck's ideas of devotion. Not much is known about Jan van Eyck's early life but he is thought to have been born around 1390 and worked as an illuminator, probably under his brother Herbert van Eyck. He was then contracted by the Count of Holland and then Philip the Good, The Duke of Burgundy. 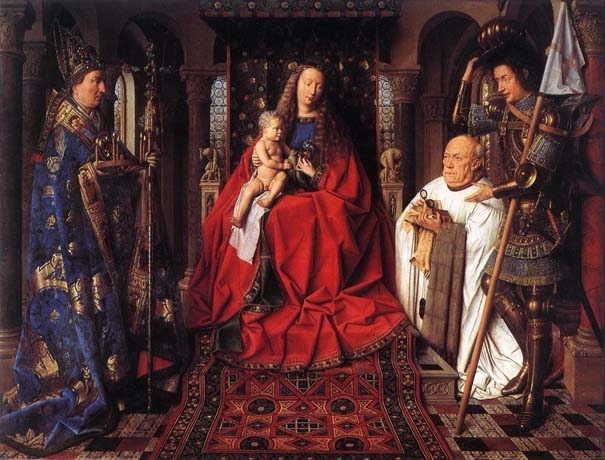 However, working under Philip the Good, did not stop van Eyck from accepting other commissions. Under Philip the Good van Eyck traveled to Italy, Portugal and possibly the holy lands. It is thought that he gained some influence in Italy pertaining to light. Van Eyck, like Masaccio in Italy, is known as one of the founders of the Renaissance. He is known for advancing oil painting into one of the major, if not the most widespread, forms of painting. His 3/4 profile view technique in portraiture is still used today. Sometime during the 14th Century Europe began to see an influx of free serfs and an increase in commerce and trade. The middle class soon disrupted the old worn-out feudal system and created a new market for art. Inventions like the printing press allowed ideas to travel farther and a growing middle class gave rise to commissions for paintings and portraits. While the Southern Renaissance relied on Classicalism for ways to reinvent themselves, the Northern Renaissance would create their own approach. Without mathematical precision, artists like Jan van Eyck used detail and indirect lighting to present their figures in a way never seen before.